What’s your weekend like? Trips to the park? Morning cartoons? We get that sometimes. But, we also have therapy sessions. My little Cyclone Kid works hard and sometimes to get enough therapy hours in. We’ll pick up a Saturday morning ABA session. Instead of Bugs Bunny, he was working on his Vocal Imitation Trials, Letter Recognition and Time Compliance. Things that he has to practice daily so that he can catch up to his peers. Like I said, Cyclone Kid works hard. Hope that your Saturday is beautiful. We’ve finally hit a Summer heatwave up here in Minnesota. 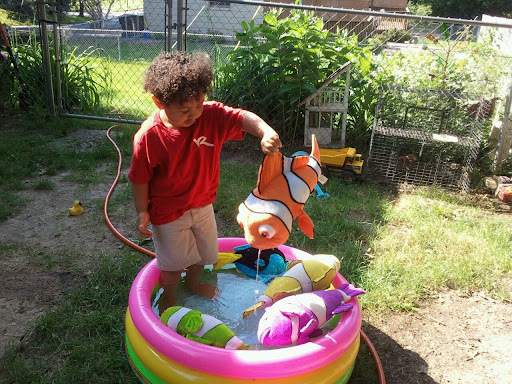 The Toddler Tornado was excited to take a dip in his baby pool and sharing fella that he is, he brought his stuffed fish along for a swim. Life with our Toddler Tornado is not always easy. Our little man has some sensory issues and with his Autism, you can’t always tell if he’s going to love something or hate it over some seemingly small detail. 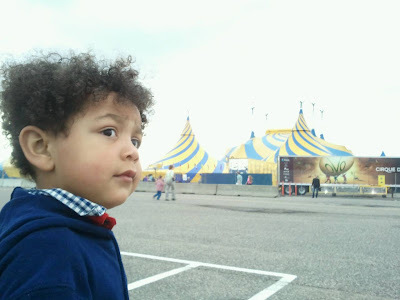 In 2009, we took him to see Cirque Du Soleil. 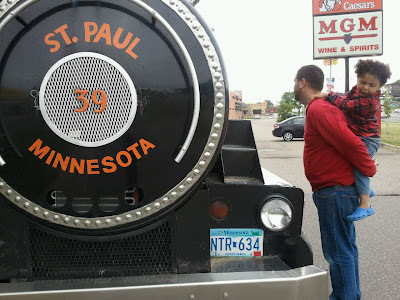 We expected him to get bored, but it turned out to be one of our fondest family memories so far. The tot loved it. He sat through the whole performance, mesmerized by every move happening on stage. He even held still long enough for us to take a family photo, something that at the time, never ever happened. Cirque was back in town recently, and of course I hoped to have another fantastic family moment. 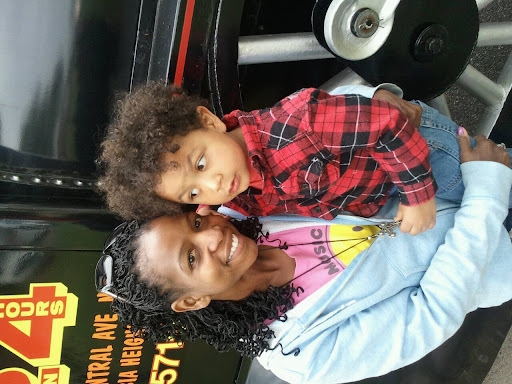 Me and the tot, amazed again by the power of Cirque. My expectations were high. Everything seemed perfect. We had great seats. I protected his ears, so it wouldn’t be too loud. He sat there peacefully cramming handfuls of popcorn into his sweet toddler face, waiting for the show to begin. The music started. The first performers took the stage. My Toddler Tornado decided to leave. He stood up, grabbed my hand and lead me toward the aisle. I tried to convince him we should go back in, but he freaked out and wanted nothing to do with it. He refused to even go back into the tunnel to give it another try. I was crushed. My high expectations crashed and my heart sank. My family memory would be of dragging my poor kid to something he hated. I was having a “Worst Mom Ever” moment. I was rescued by the staff at Cirque Du Soleil. The offered to let us watch the show on the TVs in the lobby. The found me a chair, that they must have brought up all the way from their breakroom or something. The gave the Tornado a show program that probably cost 10 bucks and showed him all the pictures. Most of all, they were understanding. Nobody looked at us weird or seemed annoyed by me and my freaked out kid. They just offered to help and acted totally normal when some mom and her son sat in the center of the lobby during one of the greatest shows on earth. We only stayed for the first half. The Todder Tornado fell happily asleep during the car ride home. Thanks to the staff at Cirque Du Soleil – OVO, My high expectations for a wonderful family memory were exceeded. Next time the Cirque Tent comes to town we’ll be there to give it another try. 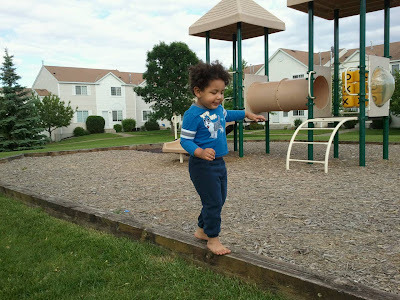 Today My Toddler Taught Me- Finding balance takes time and effort. And we all fall a few times before we get it right.